Dr. Howard Weinstein of Mass. General Hospital's childhood cancer program is running through the pain of an injury to raise money for cancer research at the Boston Marathon. The chief of Massachusetts General Hospital's Childhood Cancer Program is running the Boston Marathon to support an important cause. Training for a marathon is never easy. You have to find the time, run the miles and deal with the injuries. A Boston doctor who heads a pediatric cancer program is running through an injury to raise money for an important cause. "Each year, I injure another moving part of my body," said Dr. Howard Weinstein. "This year, I have a partial tear of a muscle in my inner thigh, it's called an adductor." An adductor sidelining Weinstein just doesn't add up — not with what he's running for. 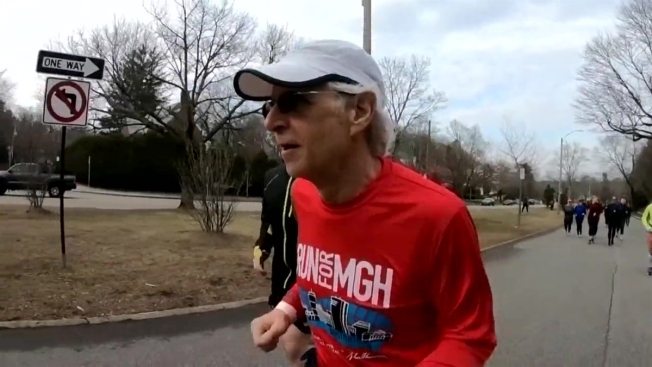 "This will be my 28th Boston Marathon to raise money for cancer research," said Weinstein. Over the years, he has had a loyal list of donors bringing in more than $1.2 million. Weinstein is the chief at Massachusetts General Hospital's childhood cancer program. Every year, he runs in honor of one patient. At mile 20 along the course, they cheer him on. "I know when I get to mile 20, I'm going to get to Boston," said Weinstein. "There's absolutely no question." The marathon falls on April 15 this year for the first time since the bombings in 2013. Howard was running with former patients during the attack. "We got close to Kenmore Square and the police stopped us and told us that the marathon was over," he said. "My patients were hysterical. They said, 'We have a mile to go. It can't be over.'" He says the meaning of the marathon hasn't changed for him since then. His focus is to create the future for those suffering from childhood cancer, one step at a time.